Vestavia Hills() Despite being indicted on 85 criminal counts, local entrepreneur Richard Scrushy has found a way stay in the public's good graces through his morning comedy 'Viewpoint'. The show, which airs as a paid program on WTTO 21, has attracted a great deal of debate. The slick professional production has drawn some favorable comparisons to Bull Connor's famed 'Mornings with Jabbo' radio show. Others, however, wisely denounce it as nothing more than a public relations stunt. 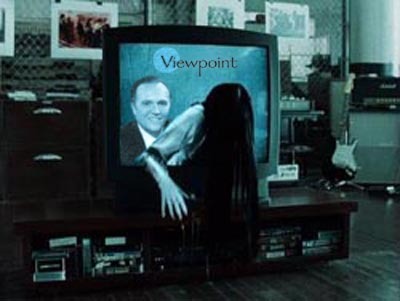 'Viewpoint' has become even more controversial now that several deaths have been linked to a videotape made of its March 10th debut. In the tape, Scrushy and beloved funnyman Roy Moore praised each other for being "what's right with Alabama." Then Scrushy's beloved wife Leslie beckoned the camera closer for a heart to heart with the audience. Many people claim the tape is a hoax since it is doubtful that anyone would purposely record the show. Nonetheless, it appears that four teenagers stumbled upon the tape in the occult section of the Vestavia Library. Shortly after watching it, the children began complaining of headaches and nausea. Before they died, all of the victims reported receiving a phone call in which a ghostly voice said "seven days." When the bodies were discovered, their faces were twisted into gruesome masks of terror and acne. Although the official cause of death was listed as heart failure, several of the parents claim that their children actually died of fright. The father of one of the teens claims, "My boy looked even more terrified than he did when Brodie Croyle tore his ACL." Ronnie Diggs, the Jefferson County Coroner who performed the autopsy, remains unfazed. "That show was never meant to be taped. The only shocking thing is why it took seven days to kill them." Reportedly, the only way to survive a viewing of the tape is to make a copy of it and give it to someone else. The threat of imminent death has not prevented the curious from trying to find the tape, as attendance at the Vestavia library is at an all time high. States one patron, "I hear before you die, you see the cowboy." 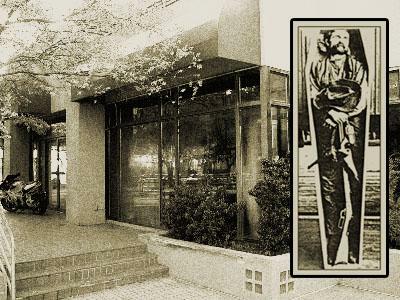 Five Points() Among all the buildings located in Birmingham's historic Five Points South business district, perhaps none is more famous than the site of the former Rube Burrow's restaurant. Although the building has been host to an incredible array of businesses, few tenants have lasted much longer than a year. While the current owner of the site, Bayer Properties, attributes this to an uncertain economy, it appears that there may be a more supernatural explanation. The site's troubles date back to the late nineteenth century, when the Five Points South area was first being developed. During the original excavations for the construction of Pickwick Plaza, workmen unearthed a Native American cemetery. Although a Bayer spokesman calls this an "unsubstantiated rumor", the cemetery's existence is verified by a Birmingham News article from June 6, 1896 entitled 'Cemetery Discovery puts Klan Pride Rally on Hold'. While many of his workers were afraid to desecrate such a holy site, developer Charles DeBardeleben was undaunted and bravely summoned armed guards to ensure that the superstitious convict labor did not slack off. The project continued as scheduled until several of the guards began to mysteriously die or go insane. Local priest and famed exorcist, Brother Bryan, was summoned to perform a ritual cleansing of the area. After the ceremony, Bryan admonished DeBardeleben to remove the heathen bodies and give them a decent Christian burial. Regretfully, it appears that the remains were merely exhumed, urinated upon, and then reburied upside down in an effort to cut costs. This desecration appears to have created a 'vortex' or doorway into another dimension. It is through this doorway that many of the evils that plague our city, such as Bettye Fine Collins and the WLAF, are believed to have appeared. Even worse, the vortex appears to have unleashed a hideous evil by the name of Smithwick Machine. Many of the deaths that have occurred on the site have been attributed to this demonic creature, although Bayer alleges the deaths were merely food poisonings caused by unsanitary kitchen conditions. Currently, the site remains vacant but rumors persist that Bayer is planning to demolish the building and build high-rise luxury condominiums in its place. Camp Winnataska(JM) Six couples went into the woods last weekend for a fall campout, to roast marshmallows and tell ghost stories. None returned alive. 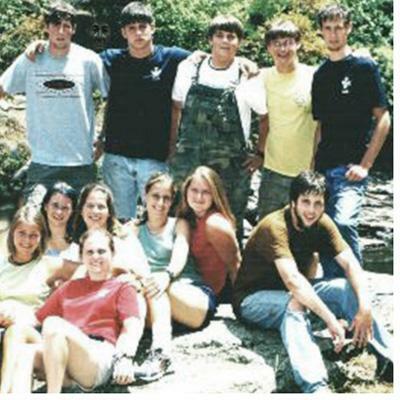 The twelve teenagers, all counselors at Camp Winnataska, ranged in age from 16 to 19. After a tough week-long camp counselor training session the teens were eager for the chance to spend some time together before parting ways for the winter. Little did they realize that they would stumble upon the legendary 'spook rock', the site where, 100 years ago that night, another dozen horrifying teen murders were committed by the 'Screaming Indian Chief' (a.k.a. 'Screaming Injun Chief'). Things started off well enough. A roaring fire was set and the teens munched happily on s'mores and downed some of the beer that one of the boys had managed to get from an older brother in a blackmail-extortion scheme. Before long it was clear that they'd need to find some more firewood. James Pinkston and Basil 'Mac' McClintock volunteered. It wasn't until 20 minutes after their raucous laughs faded into the piney woods that Rhoda Spalding asked if they'd come back yet. It was while everyone was shrugging at each other that the first other-worldly screech was heard echoing, as if from a far-off valley. "Relax, girls, it was just a bobcat," said Titus Travers with only a hint of uncertainty. "I'll find them. C'mon Kato." Karl 'Kato' Willhite, who was sharing a blanket with his girlfriend Ida Samuels, groaned and reluctantly joined Titus in the search. As their flashlights played against the spindly tree trunks, Karl caught sight of something that froze his blood. A severly mauled leg clad in McClintock's trademark camouflage overalls was draped stiffly over a pile of branches. A blood-soaked trail led into the ravine, but Karl wasn't about to follow it. He fled back in what he thought was the direction of the campfire, screaming bloody murder. Suddenly he felt someone gaining on him, when he turned to look the last thing he saw was a tomahawk embedding itself in his forehead. Meanwhile, back at the camp, Susan Childress, Fanny Brooks and Amy Guntersen huddled with Ida under a blanket while Ernie Thrash stalked the edge of the fire-lit clearing calling for his friends and peering into the impenetrable woods. Suddenly the sound of slow plodding footsteps was heard! The girls screamed as James stumbled into the light, wide-eyed, with his mouth badly burned and frozen in a grisly scream. There was no doubt about it. The Screaming Indian Chief had returned to kill again, just as he had 100 years ago that very night! While Ernie tried to revive James, Amy felt a sudden panic and, defying the shreaked pleas of her companions took off sprinting up the trail. Her corpse, badly broken, was the first to be found by authorites the next morning. Fanny's body was found near the campfire, drained completely of blood. Rhoda was immolated on the campfire. Susan was alive when the authorities arrived, but died soon afterwards in a convulsive fit. Titus' body was never found. The Screaming Indian Chief of Winnataska, be he supernatural spirit or depraved mortal killer, remains at large.